02:00:00 Makes 21 servings, 2 truffles (38 g) each. 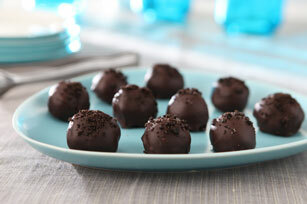 These Easy OREO Truffles are as easy as 1-2-3. OREO Cookie crumbs are blended with cream cheese and covered with a semi-sweet chocolate shell for the best-tasting chocolate truffles ever. To easily coat truffles with melted chocolate, add truffles, in batches, to bowl of melted chocolate. Then, use 2 forks to roll truffles in chocolate until evenly coated. Remove truffles with forks and allow excess chocolate to drip back into bowl before placing truffles in prepared pan. Sprinkle truffles with coloured sugar or sprinkles in addition to, or instead of, the cookie crumbs. Stir chopped nuts into remaining melted chocolate; spread onto waxed paper-covered baking sheet. Refrigerate until firm. Break into pieces. Store in tightly covered container in refrigerator. Substitute 1 pkg. (350 g) Chips Ahoy! Cookies for the Oreo Cookies. Substitute 1 pkg. (350 g) Pirate Oatmeal Peanut Butter Cookies for the Oreo Cookies. Serving Size Makes 21 servings, 2 truffles (38 g) each.